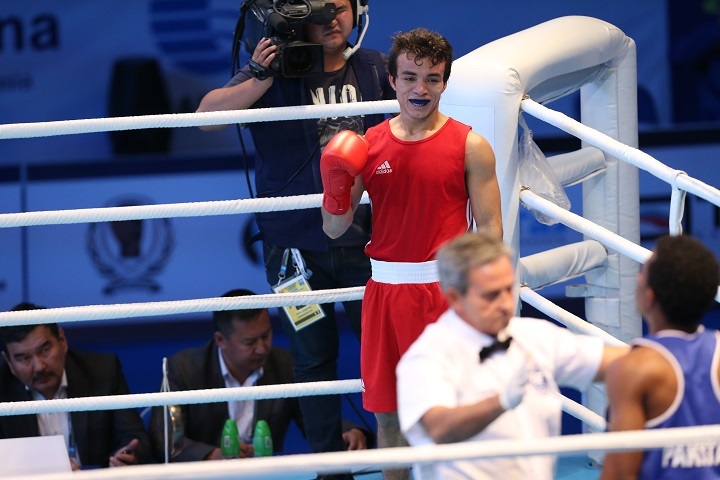 AIBA's pioneering development program, "Road to Dream" had a double success today at the AIBA World Boxing Championships Almaty 2013 with two of the project's boxers winning their preliminary bouts in style. There were also a few unexpected results with some well-known boxers going home surprisingly early. Let's review the action as the Bantamweights (56kg) and Middleweights (75kg) continued their efforts this evening. Eduardo Castellon raised the USA supporter's voices to fever pitch at Bantamweight against Selcuk Eker of Turkey whose own fans responded as the atmosphere in the arena began to intensify. At the opening of the second round, the Turk really came on and was absolutely swinging for the fences in a whirlwind of action that saw the American get caught badly a few times, after which he slowed. Yet towards the end of the second there were signs that the Turkish fighter was punching himself out through his high octane work rate. He hung in there though, recovering well during the break and doing enough to secure a 3:0 win despite a frantic third round. Brian Gonzales, who made his debut for the Mexico Guerreros against the Cuba Domadores this summer had to face both the talent and crazy luminous yellow shoes of Tafari Ebanks from Cayman Islands in his opening bout. The Mexican Bantamweight seemed to be biding his time in the first round a little, but this only allowed Ebanks to grow in confidence. In the second round, the Mexican cranked it up a notch and threw shots that really rocked the Cayman athlete, who to be fair, returned fire aggressively. Nonetheless it was Gonzales who went forward as expected with Ebanks earning significant praise for his efforts. "He was a tough opponent, but of course, as it's the World Championships, everyone here is tough", said Gonzales. "He was a little bit less experienced than me but man he was strong and quick on his feet! It was the first bout of the event, so naturally I felt a bit nervous. But I feel good now. I still need to do a lot of work on my body shots so they are coming off a bit more smoothly. That's important to get right if I'm going to get a good result". Ramon Nicolas of Cuba took on Aljaz Venko of Slovakia at Middleweight. The Cuban seemed to cruise through his opening round, perhaps taking time to profile his opponent, who didn't take the opportunity to impose much of his game on Nicolas. Surprisingly, the Cuban was just as chilled out in the second. He seemed to be willing to do the whole bout in third gear doing just enough to stay ahead and to save himself for the rest of the competition. This is probably a sensible enough tactic at this level, but it was frustrating to watch and offered little in the way of entertainment. Meanwhile the Slovakian came on a bit, but Nicolas had shut the match down and eased his way to victory over the Road to Dream boxer. Juan Donis of Guatamala looked outstanding against Nadir from Pakistan dropping him twice in the second round with a flurry of punches on both occasions. The second time round he landed a stunning body shot to cut the Pakistani down like an old dead tree. This was an excellent win for both Donis and the Road to Dream program. "Thank god we managed to do it! ", said the delighted Guatemalan. Phub Sigyel of Bhutan was also highly competitive at Bantamweight against the Belarusian Dzmitry Sapon. He was aggressive in his approach to the bout and certainly had no intention of going home without a fight. He didn't give his Belarusian opponent any space to box and would lunge in with an attack, score and then quickly clinch, leaving his opponent with limited chances of responding. This was not a very pretty tactic but it was effective nonetheless, and it gave him the win 3:0. Astana Arlans Kazakhstan boxer Konstantin Snigour of Israel, who was ranked 6th in the WSB last season was welcomed to the arena in Almaty with the same warmth afforded to the local national team. The crowd roared when his name was announced against Shinebayar Narmandakh of Mongolia at Middleweight. Snigour showed none of the apathy towards his opponent that Nicolas of Cuba had, which was probably fortunate all things considered. The Mongolian landed two hard blows in the first round with his right hand, one opening a small cut, to emphasise the fact that this was not going to be a walk in the park for the fan favourite. The great Israeli boxer continued to struggle against the tall Mongolian who managed to out-point him throughout the three rounds. It was another epic clash, and another one which also saw the surprise early departure of a highly rated WSB boxer. Donchai Thathi of Thailand seems to be another one to keep an eye on. He looked like a machine against Latvia's Dmitrijs Gutmans. Absolutely nailing him in round two, the Thai athlete forced the Latvian to take a standing eight count after he threw a series of combinations that flowed as flawlessly from one to the other as do the gear changes in a high end Porsche. He backed off in round three, knowing the bout was already won and showed that his evasion skills are equally silky. He is definitely one to watch. "We've learnt a lot of stuff from the Road to Dream training camp that we can take home and apply to Guatemalan boxing to help raise the standard. I'm sure this will also have an impact on our results in the future" -Guatemalan national coach. On the fan Richter scale for non-local boxers, the Mongolians and Cubans seem to be way out in front for noise and cheering during bouts, with the USA and Hungary following closely behind. Obviously, this fact of the day is based on entirely scientific analysis. The highly anticipated return of the Flyweights (52kg), Light Welterweights (64kg) and Heavyweights (91kg) where we will be able to watch Italian superstar Clemente Russo, Wales' Andrew Selby and Erislandy Savon from Cuba. Don't miss it!